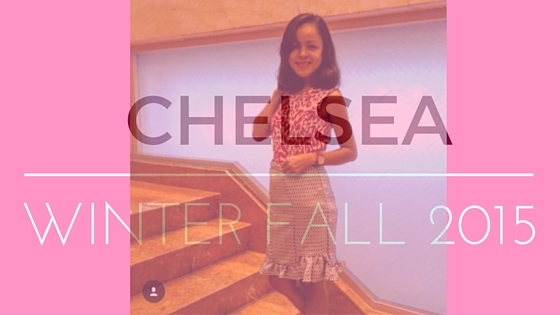 CHELSEA, a London-based clothing company for women is now in the Philippines. In an intimate event held at Fairmont Hotel in Makati, #ShopAtChelsea was celebrated with the launch of its Winter Fall Collection 2015. The collection features floral and lovely printed dresses, jacquard dresses and skirts with colorful patterns and the 1960's inspired women's clothes. Bloggers were invited to participate in the #ChelseaLookChallenge and choose their favorite piece from the collection. I personally love the yellow dress wore by Ms. Ryza Cenon. “Tastefully dainty, sophisticated yet fun and modern.” This is how Chelsea’s founder, designer Kimberly Tugade describes her brand. Founded on the premise of making it easier for women to look effortlessly stylish and chic, Chelsea is famed for pieces that allow women to go from work to play without looking over or underdressed. You would be surprise that every Chelsea piece was created for every Filipina. These ladies apparel can be worn anytime of the day, from office to semi-formal gathering. Not to mention that they are also affordable, you can get one for less than a thousand. Chelsea clothes are currently available in the Philippines through Zalora and all Wellworth Department Stores in Ayala Malls, one in UP Town. Starting this December, it will also be available in Cebu through Robinsons Galleria Cebu.